Cambodia generally isn’t the first, or second, destination Aussies consider when booking a holiday to Southeast Asia. Despite the raw and relatively untouched beauty of its landscape and people, we tend to flock to its better-known neighbours, Vietnam and Thailand. It is still super untouched by tourists, meaning you can really get an authentic glimpse into a country very different from our own. 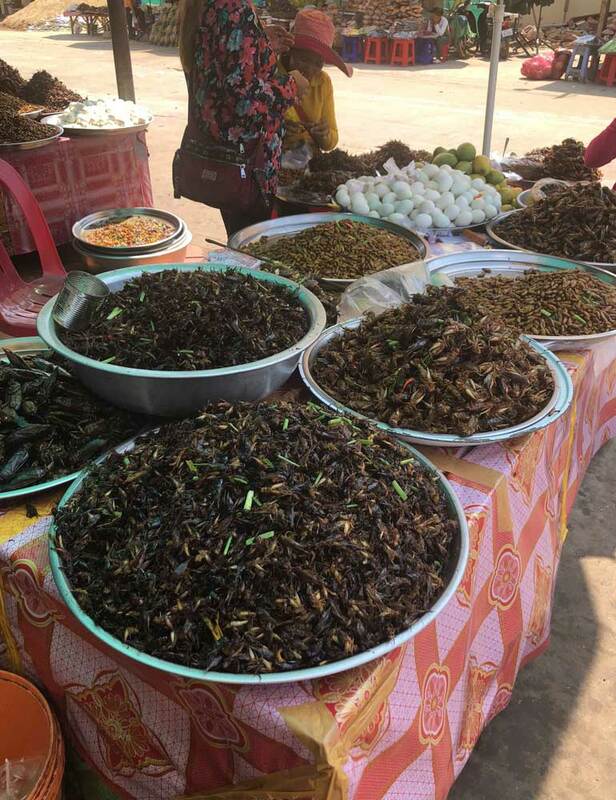 It is cheap as chips… or crickets if you’re looking for a Cambodian snack. I had the pleasure of visiting Cambodia for 10 nights in May. Not only did I get a mad tan and lose about 3 kilos just from sweat, but I also had the opportunity to meet incredible people and experience a culture completely outside my normal realm of understanding. 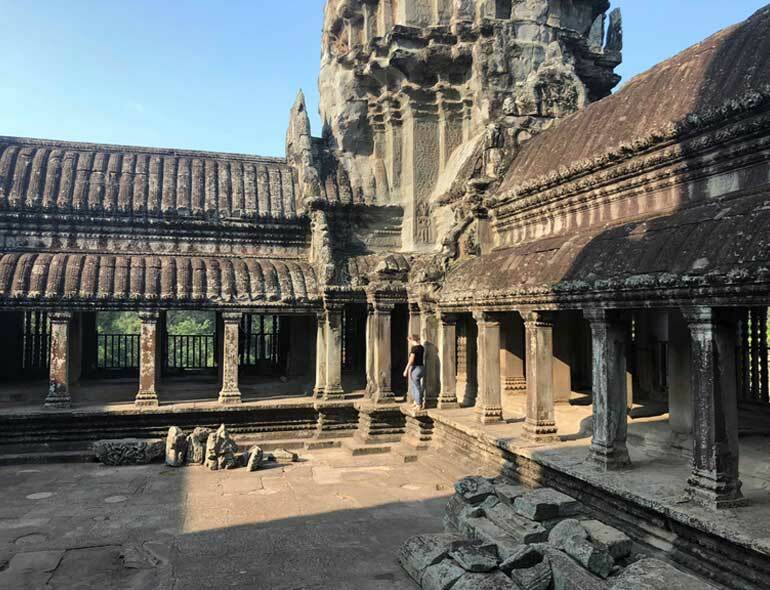 To get you on the Cambodia bandwagon I’ve put together a highlight real of sorts, explaining both where you must visit as well as how much you should budget. Cambodian Riel (KHR) and United States Dollar (USD). The riel is their national currency, however, USD is widely accepted and generally preferred. This often means you will get your change in both USD and riel, which can be rielly confusing. To make this easier, just remember that 10,000 KHR is about $2.50USD and $3.50AUD. Most importantly, cash is king. You will find ATMs in major cities, though they are pretty dodgy and unreliable. I recommend splitting your budget with 60% USD and 40%KHR. From there, split it again so that 70% is cash and 30% is on a Travel Money Oz Currency Pass (in USD). You want to avoid having all your cash on you for both safety and ease of use, so a card definitely comes in handy. If you’re an Australian citizen staying for less than a month you can gain a visa on arrival. You’ll need your passport (obvs) and just under $40USD. With that in mind, lines can be pretty hectic so I would recommend obtaining your visa before you leave Australia. Chat to your travel agent to sort it out so you can spend less time at the border. The official language of Cambodia is Khmer. Unless you are in the Phnom Penh or Siem Reap English is pretty hard to come by. For this reason, I recommend travelling on a tour or with a guide. If it’s your first time visiting Cambodia, deciding where to go can be pretty daunting. You definitely won’t be able to see all of Cambodia’s splendour in one trip, however visiting the following locations will give you a pretty good glimpse. Home of a realm of iconic temples including the picturesque Angkor Wat, Bayon and Ta Prohm. If your time is limited, you can easily smash out three or four temples in a day. After some seriously insta-worthy snaps? Make sure you’re at Angkor Wat for sunrise. It is almost as breathtaking as the heat that arrives once the sun rises. With this in mind, be sure to take your water bottle, ensure your shoulders and knees are covered and perhaps bring an umbrella for shade. Siem Reap as a city allows you to feel a strange mix of the expected hustle and bustle mixed with a unique sense of calm. The locals are friendly and generally aren’t in too much of a rush. Try a cooking class as I did and learn how to make some deliciously authentic Cambodian curries, or simply wander the streets and take in a unique atmosphere. The nation’s bustling capital full of intricate pagodas, busy streets and a chance to learn about Cambodia’s history. 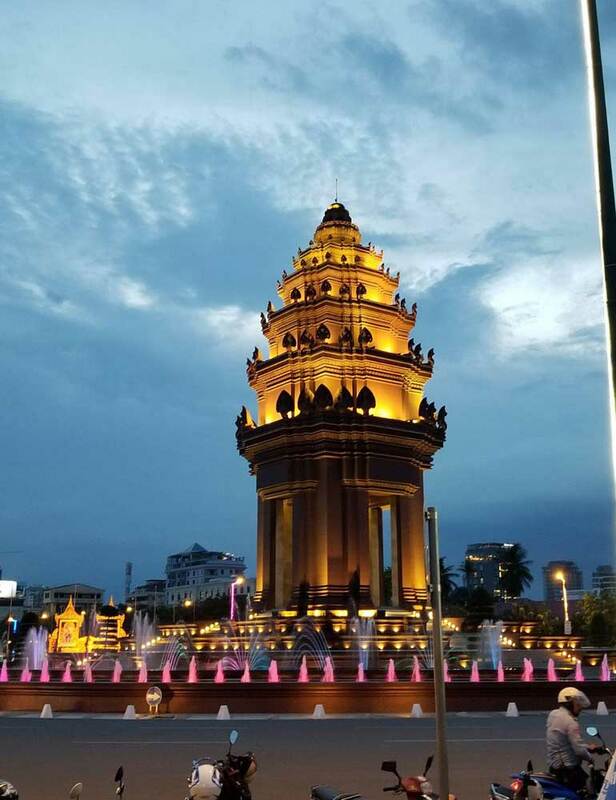 As you would expect, staying in a bigger city is slightly more expensive than towns further afar, however, Phnom Penh is still an incredibly affordable addition to your Cambodian itinerary. Despite the city’s rapid expansion alongside its increased exposure to Western business, there is still an innately authentic charm to its vibrant streets. I recommend grabbing some cash and taking a wander. Overwhelm your senses as you meander through streets and markets, then gain an understanding into Cambodia’s very recent hardships at the Choeng Ek Killing Fields and Tuol Sleng Genocide Museum. Entry to both of these places will cost you less than $10USD per person, and are a must do to truly grasp what this country has endured. An underrated, must-see city on the Mekong River that is just under three hours away from Phnom Penh by bus. Kampong Cham is a rural province where life moves at a slow pace, making it the perfect place to catch your breath amidst the Cambodian heat. The city itself is known for its bamboo bridge to a small island. In the past, this bridge was taken down as the tide rolled in and rebuilt every year in the dry season. Quite a feat, however, this ritual ceased in 2016 as the bridge was replaced with a concrete version. You can also check out a large temple complex with intricate buildings and history. I recommend hiring a bike to explore the mainland and waterfront before crossing the bridge to cycle on the dirt roads through villages where local children greet you with colourful outfits and huge grins. The town and its activities are very cheap to enjoy. $30AUD would be enough to cover your transport, activities and some deliciously cheap food at the night market. What better way to get an authentic Cambodian experience then by living with a family for a night or two. 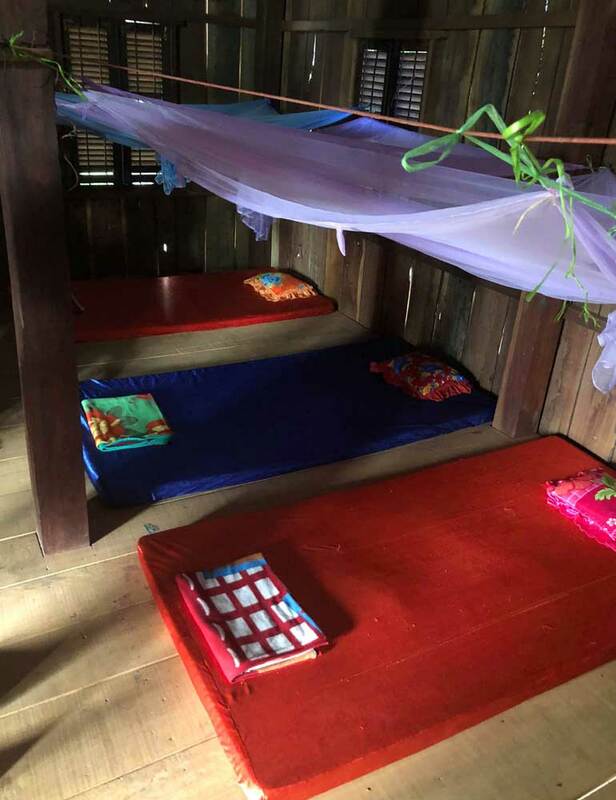 I did my homestay in Chambok, however, there are plenty of other options throughout the country. Strip back your holiday to the essentials as you lose phone reception and get welcomed into a quaint home. It’s amazing that despite speaking two completely different languages interactions are seamless as you share a meal with your host family. The best part? 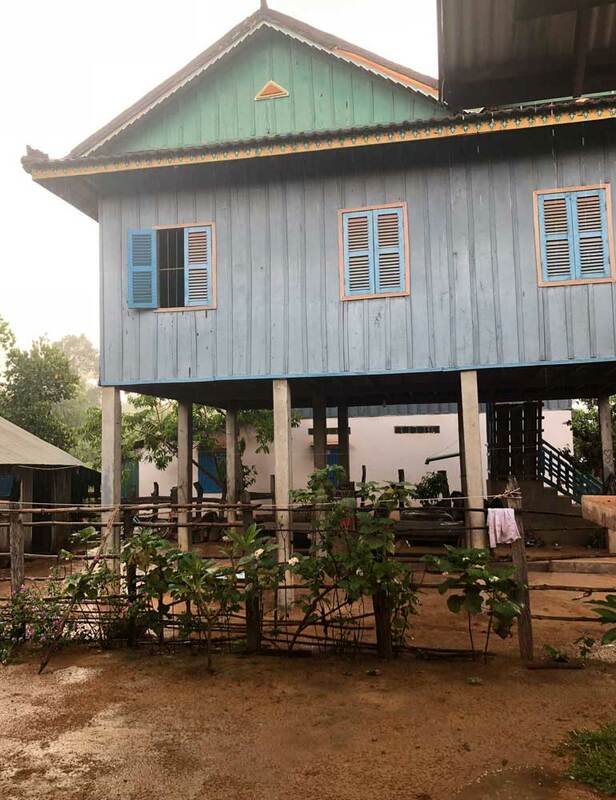 Your (very affordable) accommodation costs go back to helping the family that so graciously welcomed you into their house, plus you can play some pretty fun soccer with the local kids. As you’ve probably gathered Cambodia is hot, especially when travelling in May (it’s shoulder season which makes it even cheaper). 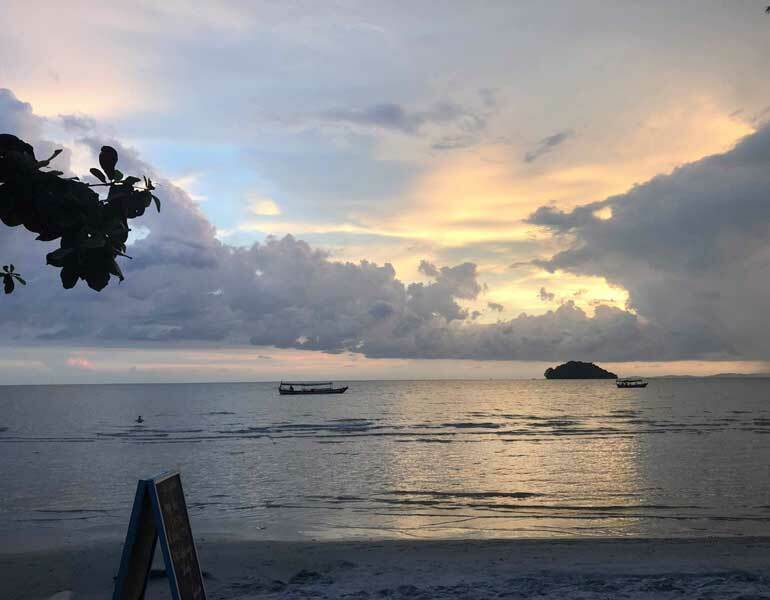 The heat leaves you craving a beachside escape, which you can find in Sihanoukville. The beach town boasts hotels and resorts that back onto the sand. The city centre itself doesn’t have much to offer during the day and is honestly a waste of time that could be spent relaxing on the beach or by the pool. In the morning, the beach is dotted with cute wooden boats ready to take you out on a day trip to the surrounding islands. From here you can swim in crystal clear water, snorkel vibrant reefs and revel in a well-deserved pocket of relaxation. Upon your return to the mainland, indulge in happy hour at your hotel or any of the restaurants located on the beach and watch the sunset. Here you can buy delicious main meals for less than $10AUD, and ‘buckets’ for about $4AUD. The beachside atmosphere is unforgettable and without a doubt one of the highlights of my trip. Sihanoukville was also where I tried deep fried bugs for the first time. Crickets, worms, beetles and spiders alike are marinated and served up. Not for the faint-hearted, but genuinely far tastier then you would expect (spiders taste like chicken and worms definitely don’t). Prices will vary based on the type of holiday you are wanting. I’ve provided some middle of the range figures, so if you’re a baller with money to spend I would bump it up slightly. Likewise, if you’re squeezing as much as possible out of your budget you would definitely be able to find things cheaper. $40AUD per night for a basic room with aircon (you will need it). I’ve seen hostel beds going for $4AUD though. Buses - The best way to get between bigger cities. An air-conditioned bus between Siem Reap and Phnom Penh will set you back around $10AUD for the 6-7 hour journey. Bus rides are the best way to take in the Cambodian countryside. Tuk tuks - You’re best means of getting around cities, budget around $1 - $4AUD for a 10-minute journey. Market dish - $1.50 - $4AUD. Think rice and chicken dishes, skewered meats and curries. Restaurant meal - $4 - 9AUD. You’re paying for the aircon and chance to escape the busy streets. I hope this information has taken you from saying Cambodi-nah to Cambodi-ahh! There is a good reason as to why this beautiful country is increasing in popularity, and I encourage you to visit before it potentially loses its authenticity to Western influence. 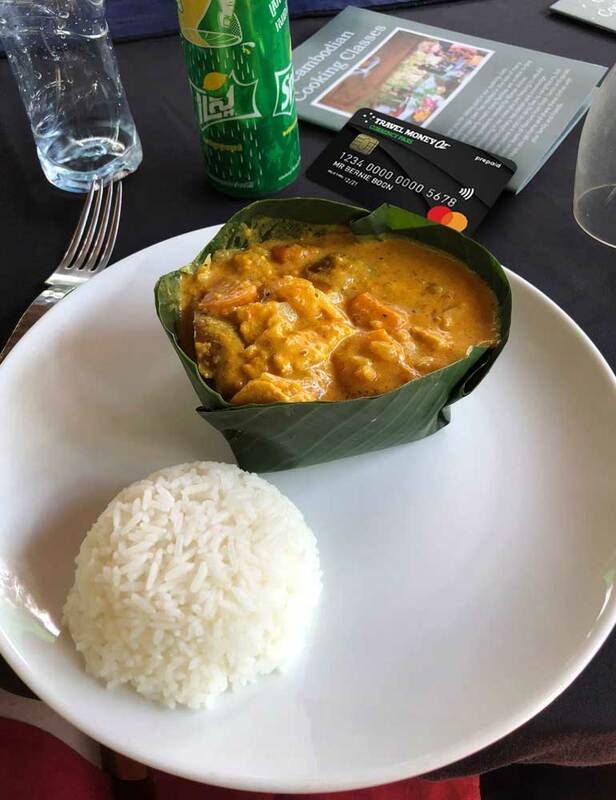 If you are after more Cambodian travel money advice or are simply ready to purchase your USD and KHR, be sure to head into your local Travel Money Oz and speak to the experts. 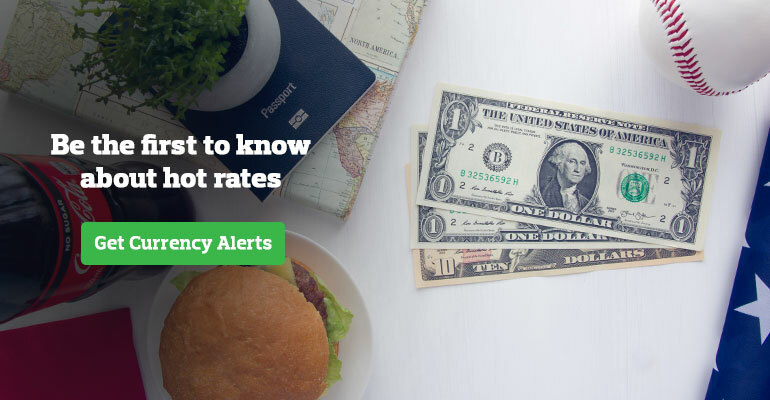 All rates are quoted from the Travel Money Oz website, and are valid as of 19 March 2019. Prices are estimations only and may differ based on your location, purchase and other individual factors.